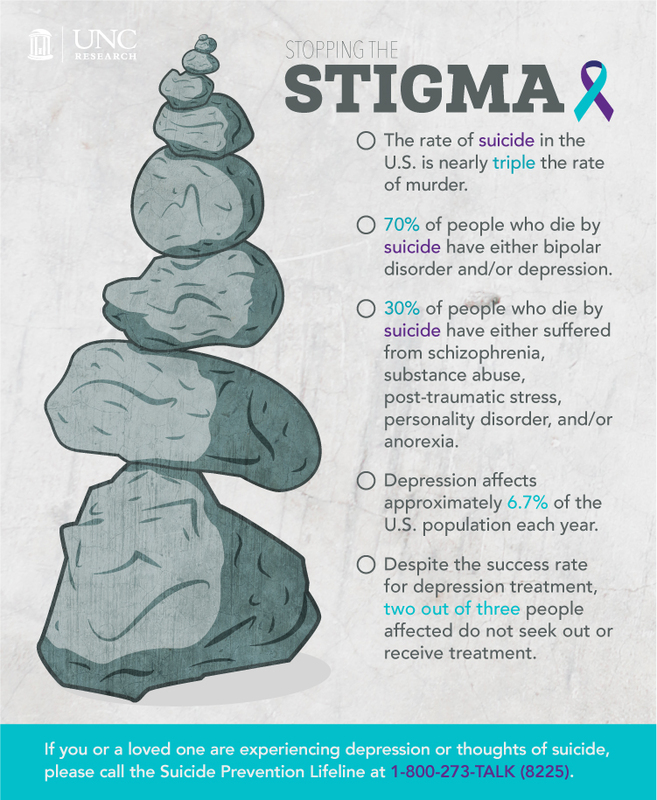 UNC-Chapel Hill faculty focus on suicide prevention — a difficult topic that needs more voice, education, and awareness. Every other Thursday, Jodi Flick walks into the library at the United Church of Chapel Hill on Martin Luther King Junior Boulevard, sits down, and waits. A stack of self-help books sits next to a box of tissues on a nearby table. People slowly filter in past the bookshelves and find a seat amongst a circle of upholstered chairs. After the group has gathered, Flick (or one of the other five facilitators) lights two candles and says, “We light this first candle to remember the light that our loved ones brought into our lives. And we light this second candle to remind us that we are still alive. We can best honor our loved ones by embodying their light in the world.” Then, each person shares their story about how someone they love died by suicide. Flick created the Survivors of Suicide Loss Support Group (SOS Group) in 2009 while working as a crisis counselor for the Chapel Hill Police Department. Meeting with families who lost someone to suicide was always a difficult task, and she felt like she couldn’t offer them the resources they really needed. She’d come back to the office frustrated that someone wasn’t doing more to help these families. “I would get so aggravated,” she explains. “Finally, after about four or five years, I realized that someone needed to be me,” she admits. Today, Flick — a social work professor at UNC-Chapel Hill — has partnered with the Injury Prevention Research Center (IPRC) as a coach for its most recent Injury-Free NC Academy. Each year, the academy organizes an injury and violence prevention program to educate participants on different public health topics. This year’s academy strives to enhance North Carolina’s capacity to prevent suicide. Social workers, police officers, public health department staff, mental health professionals, lawyers, and community activists from 22 counties across the state took part in the six-month workshop to develop these skills. Imagine a pile of teetering rocks. Depression and bipolar disorder are the boulders that sit at the bottom of the pile. Then, layer on a series of smaller rocks like sexual abuse, traumatic brain injury, job loss, or drug addiction. Each additional rock makes the pile more and more unstable. Eventually, it crashes to the ground. Not many people realize that the rate of suicide in the United States is nearly triple the rate of murder, Flick says. “That’s because murder is on T.V. and in the newspaper every day. We keep suicide out of the media because we don’t want to sensationalize it,” she explains. But everyone knows someone who has died from suicide. That’s why talking about it is key. Prinstein’s research focuses on adolescent peer relationships — how young people get along with one another, who’s popular, who’s teased, and who’s friends with whom. He’s appalled by the statistics surrounding self-injury like cutting. Approximately seven percent of middle-school-aged children cut themselves. By high school, that number increases to 15 percent — and to 50 percent in children who have been diagnosed with a mental illness. In response, Prinstein is throwing all his energy into the UNC Girls’ Health Study, which will recruit girls between the ages of 9 and 14, who are suffering from sadness, depression, anxiety, stress, or related symptoms. Last year, Prinstein received a $4 million grant from NIMH to study how stressors affect DNA in relation to suicide. Stressors can activate dormant DNA that affects the production of serotonin — a chemical in the brain that impacts mood, sexual desire and function, appetite, sleep, memory and learning, temperature regulation, and social behavior. A change in serotonin levels can trigger depression and lead to suicide. That’s why Prinstein wants to uncover the stress responses directly related to suicide attempts in adolescent girls. He hopes this information will help mental health professionals and the public shut down the psychological processes that put these teens at risk. Last year, the School of Social Work received a three-year grant from the Substance Abuse and Mental Health Services Administration to administer mental health first aid training to 25 percent of the faculty and staff at UNC. In January, the school began offering a day-long class that teaches attendees first aid for panic attacks, psychosis, substance abuse, and suicide. Flick and three of her colleagues within the School of Social Work lead the class. Jodi Flick is a clinical assistant professor and education specialist in the UNC School of Social Work, and has been with the university’s Family & Children’s Resource Program since 1997. She has more than 35 years of direct experience as a mental health counselor and social worker. Mitch Prinstein is the John Van Seters Distinguished Professor of Psychology and Neuroscience, and the director of the Clinical Psychology Graduate Program. The UNC School of Social Work’s Mental Health First Aid program is an eight-hour training course designed to give members of the public key skills to help someone who is developing a mental health problem or experiencing a mental health crisis. Just as CPR training helps a layperson without medical training assist an individual following a heart attack, Mental Health First Aid training helps a layperson assist someone experiencing a mental health crisis. To learn more, click here.